Good Friday is Peel District Day! Easter Egg hunt before the footy starts! Free entry for Parents that arrive before 11:15am! Chance to win cash for your local Junior Football Club! 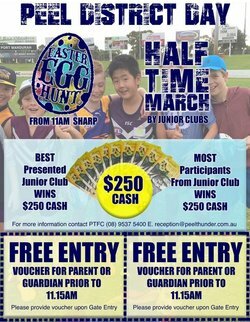 Come enjoy the fun on Friday the 14th April at Bendigo Bank Stadium!